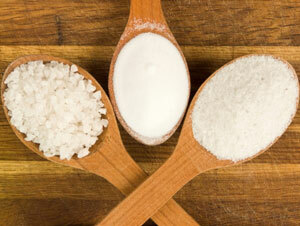 Regular table salt and sea salt – what’s the difference? • It goes through a process that removes the magnesium and trace minerals. • In order to keep the salt dried out, various additives are included, such as aluminum compounds. • The natural iodine is also destroyed during the refining process, so it is usually added back in the form of potassium iodide. • Dextrose is added as a stabilizer, which affects the color, and so a bleaching agent is used to finish it off. In contrast, a good quality sea salt is sun dried. It will still contain microscopic amounts of sea life, which provides natural iodine. It will be gray in color and even slightly moist. This means there is a large mineral content. I really like Celtic sea salt. Red sea salt from the shores of Hawaii is another great option. Sea salt has a much stronger flavor than table salt, so you don’t need to use as much. The kind I use is pretty coarse, so I put it in a salt grinder. This is not the same as a pepper grinder – a pepper grinder has steel blades for hard peppercorns, while a salt grinder has ceramic blades that resist salt’s naturally corrosive properties. I dry the salt out very gently in my toaster oven on low before putting it in the salt grinder, so that it will pass easily through the blades. If you are going to purchase canned or processed foods, look for those without added salt. Unless the item is organic, it usually won’t contain sea salt, but rather the highly refined form of salt – and often in very large quantities. You can always salt the food yourself with sea salt; it will taste better and be better for you.